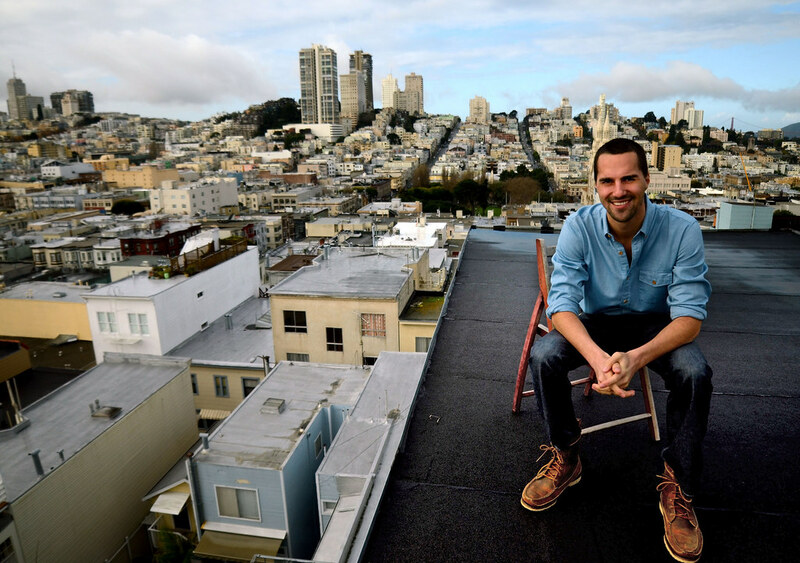 Michael Perry, 26, took seven years to graduate from SF State and since then has used his entrepreneurial spirit to create the Gving App, an iPhone and Android application helping out local businesses by rewarding loyal customers. Photo by Frank Leal / Xpress. Hot out of SF State, business major graduate Michael Perry entered the world of Silicon Valley with fire and passion, and a plan for a simple mobile phone app that he knew would sell like hotcakes. “No one wanted to believe in us because we were from SF State,” Perry said. Perry would attend networking party after networking party searching for investors. He shook hands with tech luminaries like Ron Conway (who was one of the earliest investors in Twitter, Facebook, and Google), and saw the same reaction time after time when he mentioned his working class credentials from SF State — a look of distrust. He didn’t let that get in his way, though. Eager to prove valley investors wrong, the East Bay born 26-year-old decided to fund his company himself. He raised money working at his father’s Volkswagen dealership and fundraising any way he could. Thanks to the sweat of his brow and a need to prove himself, Perry succeeded — making a mobile phone app adopted on campus at SF State and at eateries across San Francisco. “Gving” is an app for the Android and iPhone that is like a loyalty card for cafés and restaurants, as well as select retail stores. It’s like those stamped cards you get for ten coffees, and then your eleventh is free; but done via app. It’s free for customers to download. 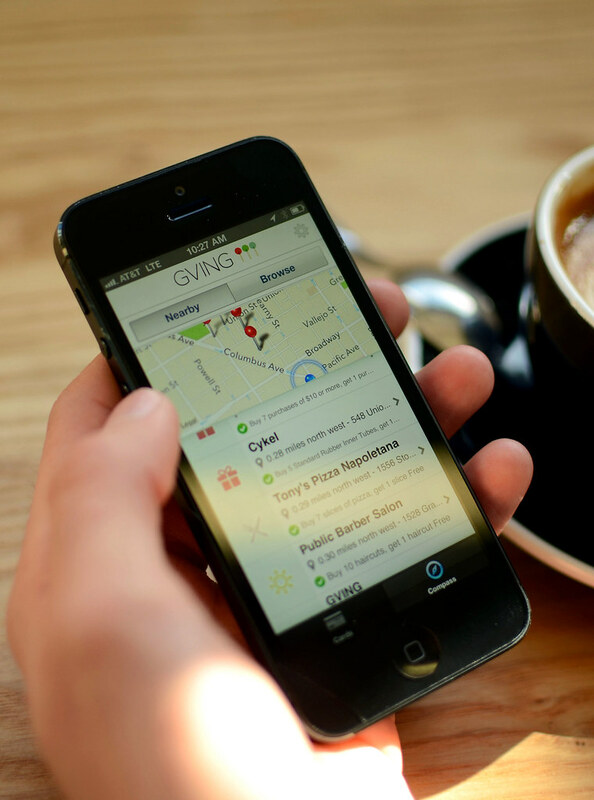 Gving is used by over 400 restaurants, cafés and retail locations in San Francisco, with a few outside the city as well. The app is supported at eight locations at SF State: Taqueria Girasol, Tuk Tuk Thai, Sushi Grub and Go, Turtle Tower, Underdog, Taza Wraps to go and even Rac ‘n Cue. Bring up the app while you’re in line at one of those spots, and Gving will use location data to determine where you are, and bring up a list of the closest restaurants that support the app. The cashier enters a short pin, and boom, you’re stamped. The app goes a step further than the usual loyalty stamp card though. Store owners can track how often you’re using the Gving app at their location, and they can use that data to “give” the customer more freebies and promotions. This wealth of data is the kind of thing Facebook and Twitter are monetizing on their own web pages. And though money is vital to every business, the tech startups are a boom and bust venture — three out of four startups don’t return their investments, according to research by Shikhar Ghosh, a senior lecturer at Harvard’s business school. His report, which came out late last year, paints a dismal portrait of most Silicon Valley startups’ futures. Allam El Qadah, owner of Tuk Tuk Thai and Sushi Grub and Go at SF State, said he was “incredibly impressed” by Perry’s business ethic. El Qadah supports Perry not just because of his business savvy, but because they are both fellow alumni. El Quadah graduated over a decade earlier in 1991 from SF State with a degree in international relations and economics, and has owned businesses on campus for over 18 years. “I always look up to people who graduate from our campus and are street-wise,” El Qadah said. Though his locations only just started using Gving, and therefore has seen modest use so far, he’s optimistic things will pick up. “I love the idea,” he said. Taqueria Girasol is seeing more success with Gving, though. Fatima Zepeda, a cashier at the taqueria, which is housed in the Cesar Chavez Student Center, said she sees at least ten students using the card a day. Notably, he has signed up stores at UC Santa Cruz and CSU Channel Islands, and is in negotiations with MIT and Washington State University. But Perry’s drive to succeed isn’t just monetary. The working class guy from the East Bay has something to prove. The competition out in the world is much fiercer he said, noting the pushback he got in Silicon Valley. Your degree doesn’t guarantee you anything but mediocrity, the rest comes from yourself. You can download “Gving” from www.gving.com, and follow the company on Twitter at www.twitter.com/GVINGapp . WE are so proud of you, and think your are remarkable!!! Wish you much success and happiness and hope that your drive for success and future dreams all come true. Tell me that is not the most adorable web comment ever. Tell me and I’ll deny it. Mike, wish you success buddy!! Keep doing what you’re doing. Your sucess fills our hearts with joy and fly like the eagles. See you at Fleet Week this year!